Ever since I started using Linux I have always carried a copy of Puppy Linux on a pen drive. I have such a high regard for Puppy Linux that I have a page dedicated to it. I haven’t reviewed any version of Puppy Linux for a while so with the recent release of Simplicity Linux it seemed like a good time to do so. The version of Puppy Linux that I have enjoyed using the most is MacPup. I have had good experiences throughout though and LXPup was definitely a decent release. Unfortunately distros come and go and LXPup is one of those that is no longer around. Simplicity goes some way to bridge the gap left behind by LXPup. According to the release page on the Simplicity website the latest version of Simplicity Linux is based on Slacko Linux 5.6. 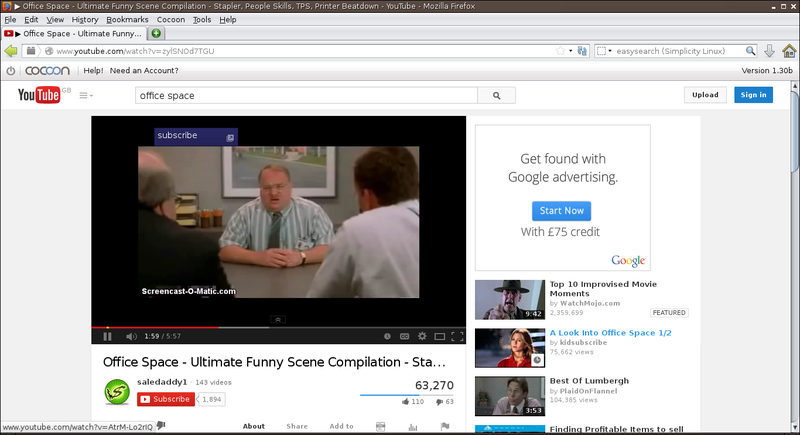 Simplicity uses the LXDE desktop and has Firefox 24 included as the web browser. Other notable inclusions are LibreOffice, Skype, WINE, Java, Flash and OnLive. Click here to download Simplicity Linux. I downloaded the full desktop version for the purposes of this review. The Simplicity Linux website has an article announcing the 14.1 release but links to downloads all seem to point to the 13.10 release. It is therefore worth clicking the link above. Installation isn’t that difficult and the file size is relatively small but if you have a slow internet connection you might prefer to buy a copy of Simplicity Linux on CD. Puppy Linux is designed to be installed to a USB drive and is ideal for carrying around with you wherever you go and it is ideal for laptops without a hard drive. Therefore all you need to do to get started is run Unetbootin and select the downloaded ISO file to create a bootable version of Simplicity. The first time that you boot Simplicity Linux you will presented with a “Quick Setup” screen that lets you choose your country, time zone and keyboard layout. You can also choose your computer’s hostname and adjust screen settings. You might notice a checkbox that says “Run internet apps as spot”. Puppy Linux doesn’t really have the concept of users. Everything you do within Puppy is done as the root user and some people think this is insecure. The “spot” user is a user that has less privileges and so the option to run as “spot” lets you choose to run internet facing applications with less power, if you are concerned about security. When you press “OK” you will boot into the main Simplicity interface. Before you get too involved in using Simplicity it is worth rebooting the system as this will give you the opportunity to create a save file. A save file can be saved anywhere. You can save it on a Windows partition, within a Linux partition or on the same USB drive you used to boot Simplicity. You will be asked to specify whether the file should be created with an ext2, ext3 or ext4 file system. You will also be asked how big the file should be. Your choice here will be governed by how much you think you will be installing and how much space you think you will use during the course of time. After you have made your choices the save file will be created and your system will reboot. The next boot of Puppy Linux takes a bit longer as it sets up the new save file. This is a one time only performance hit and any subsequent boots should be back to normal. One thing I did notice which was a bit frustrating was that if you chose not to create a save file then you are forced to wait 240 seconds before the computer will shut down. It may feel like a minor point because most people will want to create a save file. If however you booted from a CD and chose to use one of the internal Puppy tools to create a bootable Flash drive then you will want to reboot into the USB drive without creating a save file. This review could have been so much different. I started off with a download of Simplicity 13.10 and I had a few issues with installing web browsers, installing applications in general and even shutting down the computer. Luckily whilst troubleshooting I noticed that the 14.1 release had become available. The experience this time was so much better. 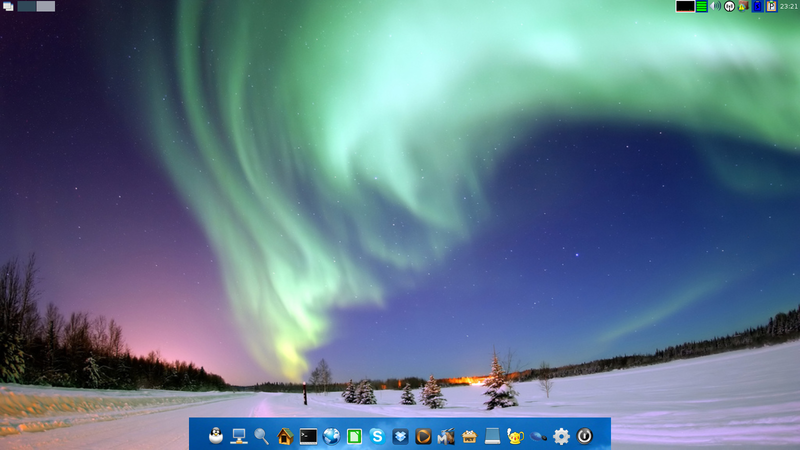 The wallpaper in 14.1 is bright and welcoming, there is a dock at the bottom with the more commonly used applications, there are system style icons in the top right corner and in the top left there are icons for changing workspaces. The performance is excellent on both my main laptop and on a netbook. Puppy Linux gives you a number of different ways to perform each task. Simplicity has made connecting to the internet slightly simpler by providing just one application whether you click the network icon on the dock or the system tray. (Other options are probably still available via the Puppy Settings screen). 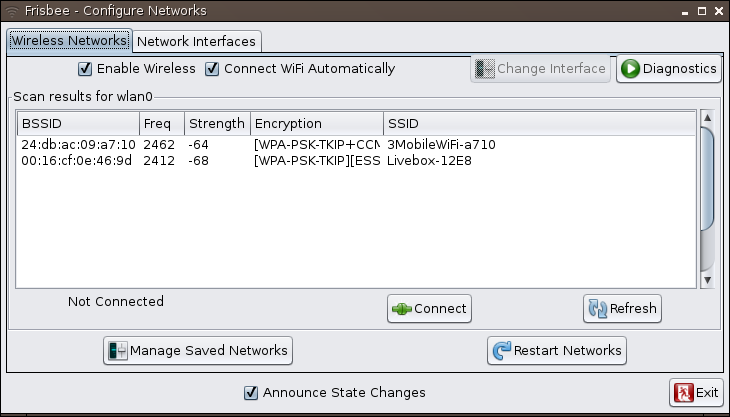 When you click on the network icon the “Frisbee” network manager appears and you should see a list of wireless networks. To connect to the internet click on the wireless network of your choice and then enter the security key. It takes a few seconds to connect and there are some verbose messages telling you the stages that Puppy is going through. Flash and Java are installed by default within Simplicity Linux and therefore you will be able to watch Youtube videos and play games online. The audio player is MPlayer and this was capable of playing MP3 files without issue. 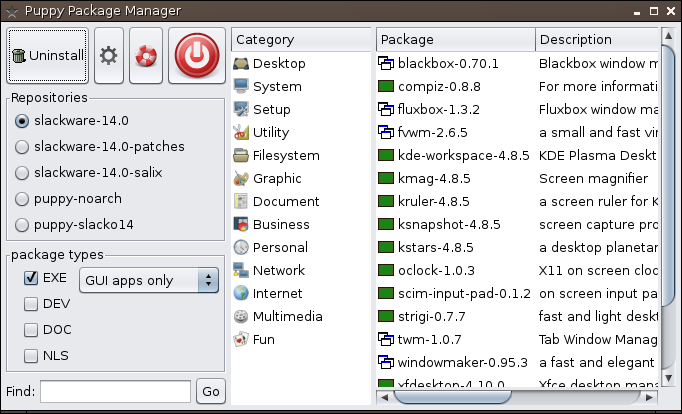 Puppy Linux always has dozens of little applications installed and it is usually impossible to list them all in a review. WINE is installed by default and there is a link on the dock to OnLive which enables you to play streaming video games hosted online. You will need a decent internet connection for playing OnLive games and unfortunately it hung for me when I used it. Other notable software inclusions are Skype and Dropbox. There are a couple of ways to install applications (pets) in Puppy. 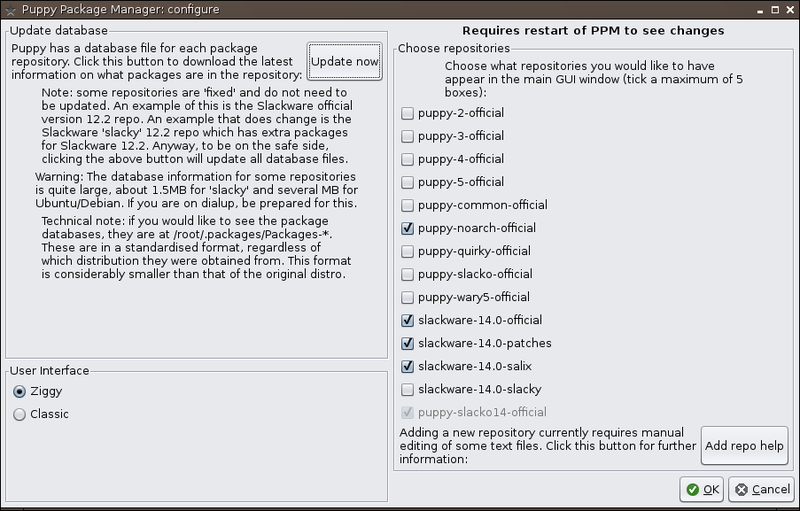 The first way is to use the Puppy Package Manager. In the top left of the screen you will see the software repositories. The “Find” box is used to search for applications and you can narrow results down by category. If you can’t find what you are looking for then you can adjust your repositories by clicking on the settings icon. The configuration screen lets you choose which repositories to pull software from. Note that you can choose up to 5 at one time. The “Update now” button refreshes the database for the selected repositories and should be used if you expect to find software in a repository but can’t. 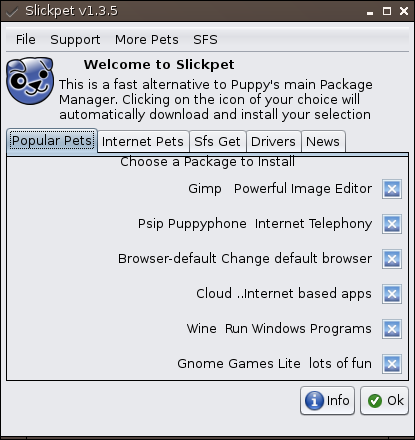 Another way to install software is to use the SlickPet application. This tool contains a list of popular applications such as GIMP, WINE, Chromium etc. You can also find drivers for specific pieces of hardware such as graphics drivers. The PupControl application gives you access to a number of different applications. If you chose to boot from a Puppy CD for instance, you can use the Boot Flash or F2FS utilities to create a bootable USB drive instead of using UNetbootin. There are also tools that enable you to remaster Puppy. This means you can create your own version of Puppy with the applications of your choice. If the default network manager (Frisbee) fails to get you connected to the internet there are a number of other networking tools that may well help with that situation. Before signing off it is worth mentioning that there are a number of different wallpapers available for Simplicity and you can change the wallpaper by right clicking on the desktop and selecting preferences. It is also worth noting that you can play Steam games on Puppy (although I have to admit I didn’t try this). There is a Steam pet available at this link. As Java is installed by default Minecraft should work as well. I have to admit that I thought I was going to have a frustrating time with Simplicity because whilst trying 13.10 I came up with a number of issues and it just didn’t work for me. This however is 14.1 and it works very very well and in fact I haven’t come across any issues of note except for the fact that the OnLive application hangs. (Probably due to my poor internet connection). Simplicity is a worthy replacement for those of you using LXPup which is no longer being actively developed. If you have a laptop with a failed hard drive sat in a corner gathering cobwebs then you can easily breathe new life into it by running Simplicity Linux on a USB drive. I agree with your comments on earlier Simplicities. I had a lot of problems also. Connecting wireless was one. I have used Frisbee with other Puppies (Saluki and Carolina Puppies) and am glad to see Simplicity going to Frisbee. It has so far been flawless for me. Your review entices me to give Simplicity another try. I never had too many issues with Barry's simple network tool but yes Frisbee does work very well. Excellent review, thanks. I was using Puppy Precise on an old 1 GB pendrive but after I've tried Simplicity (I did it when it came out, saw it on Distrowatch) I now use it instead of Puppy (on a more generous 4 GB pen drive). I think it's much more beautiful than Puppy, has the same functionality but a way more better interface. Also it's bug free so far and much better to recommend to non-Linux friends since Firefox is already there and they all love the Mac-like interface. Simplicity has that "cool" factor and that seems to make the difference to people new to Linux. Also like I said it has all the functionality of any Puppy but with better software pre-installed. It did something that I thought it couldn't be done: replace Puppy. I had the same issues. It should be noted however that the latest release doesn't include obsidian. My Netbook installation also came bundled with Chromium. 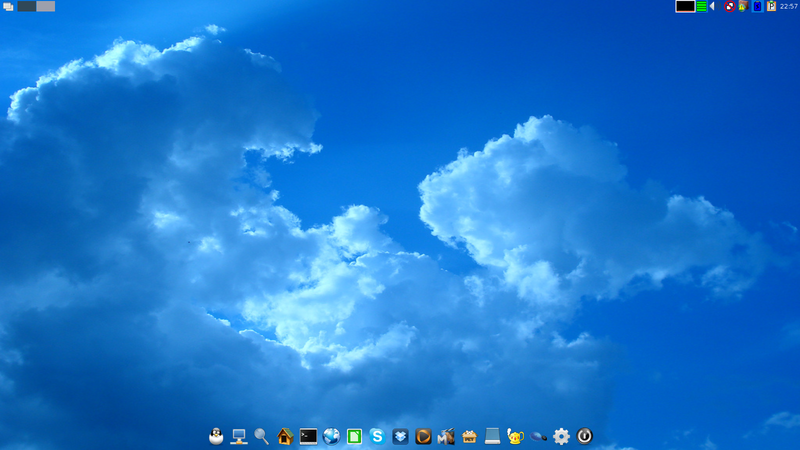 I started using Simplicity Linux 14.1 couple days ago, and must say one of the simplest distro I've been using. Everything works just fine (music, videos, internet…). But I have one huge problem, I can't install singe one additional program through PPM, nether I don't know how to do it manually. I'm founding apps on PPM, and install, I got confirmation message that I can find it on app list, but there isn't any. Also, for instance, I see on PPM that Transmission (torrent) is installed (green checked sign), but I can't find it on app list. So, my question is, can someone please write short tutorial how to install new programs on this distro? Or to post a link here. It would be so much helpful. I bought the book at the old price, and have You enlightened me on Linux. You must be a technical writer in Your other life. Every thing You talk about is so very easy to understand. I am a novice at Linux. But You have made my transition to Linux so easy. Simplicity 14 is the Bee's Knees as for as I am concerned. Very easy on the eyes and so easy to work with. My old Acer AOA-150 died on me & I installed Ubuntu back in 2010. Learned a lot. But would like to downgrade to Simplicity 14. I have it running in a Partition now, but would like to get rid of Ubuntu. How is this done? My Partition is way behind Ubuntu on the graphic table. Should I reformat and start Over? That is my Question for the Month. Point me in the right direction if You would. I started in MS-DOS 3 way back when and learning the command line Linux. Your and any help would be appreciated. Jimmy Alexander Retired Marine Clerk in Houston. If you are using Simplicity there is no requirement to install it to your hard drive at all. It will work perfectly well off a pen drive. If you want to get rid of the Ubuntu that you already have I would recommend making sure that you have backed up all of your important files (too an external hard drive, cloud service, nas drive, pen drives or even DVDs). There is an install option within Simplicity that installs it to your hard drive and that will wipe your existing partitions. leaving just Simplicity on your drive. I will have a look to see exactly how that works because I haven't done it myself and I will get back to you. simlplicity "developers" simply took others code (lxpup) and redecorated it. That's more or less the starting point of doing your own distro. Next step is to add/subtract some apps, as your preference may be, and make sure that everything (!) works as planned. What was the point of your comment, bearing in mind that LXPup is no longer supported, apparently? Does anyone know is Simplicity linux can be installed on a chromebook – Toshiba CB30.? If you follow the instructions for creating a Simplicity USB drive in my Simplicity review and then follow the steps in this guide for getting into developer mode. You should then be able to boot from USB. Simplicity (and all versions of Puppy) are developed to be run from a USB device. Thanks for your useful review, Gary. I downloaded Simplicity (Netbook version) for my Acer Aspire One netbook. Looked very good. However I couldn't get my scratchpad to work.. and the System icron (on the,…Cairo dock?) wouldnt work either. Pitty.. looked good too. At our school board we wanted to convert some of our old Netbooks to Puppy Linux but could not figure out how to configure the WIFI on our WPA2 enterprise network. We had no problems with other linux distros. Would you happen to know how to get this done? WPA2 Enterprise, PEAP, no security certificate, Inner authentication: MSCHAPV2. I have tried simplicity 15.10 desktop version. Not able to reduce screen brightness, though I had installed xbacklight by package manager. Any suggestions.